If you have worn your diamond jewellery for a while and wondered why it has suddenly become dull and lifeless, a dirty stone is the likely cause. 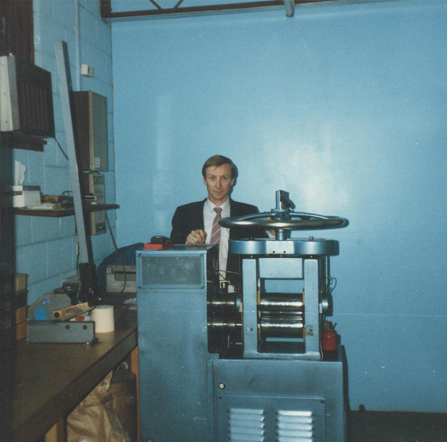 In October 1978 Peter ventured on his first overseas trip for the company and purchased a rolling mill from Milan so that the company could create its own sheet and wire. Back in 1976, Peter William Beck started his very own business making wedding rings and selling precious metals, he called it ‘Peter W Beck’. 40 years later, Peter William Beck is seated in Adelaide as the Managing Director of one of the largest Jewellery Manufacturers in Australia. Join us on a journey through history as we look at some of the highlights our beautiful company has seen over the past 40 years, and help us celebrate this amazing company milestone! Established in 1976, Peter W Beck is renowned for its extensive collection of high end jewellery. Boasting a superb reputation within the industry and offering over 4500 styles for both women and men, Peter W Beck is a favourite for discerning brides and grooms. The collection includes a range of classic and unique wedding rings encompassing a variety of styles and all available in a myriad of metals including Yellow, White and Rose Gold, Platinum and Palladium and Titanium. Every wedding ring is manufactured using world leading technology combined with traditional craftsmanship, using the finest Precious Metals controlled by stringent quality control techniques to ensure consistent quality and standards.